High Q specialises in maintenance projects where work is needed at high level, or where access is difficult, and in confined spaces. The costs of other means of access for some of these tasks may be out of all proportion to the work being done – or it may be impossible to use other access methods in certain circumstances. 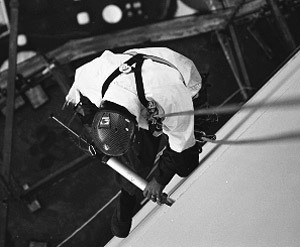 Where small scale concrete and sealant repairs are required at many different locations on a structure or building, rope access is the ideal solution. It provides for quicker turnaround and minimum site disruption. High Q have carried out concrete and sealant repairs at locations as diverse as flue gas and cooling towers, air traffic control towers, to storage silos, to residential apartment blocks.